I was an extremely picky eater as a child, largely existing on buttered noodles, canned tuna, and Laverne & Shirley reruns for much of my childhood (read: My Picky Eater Recovery). My very kind, sweet mother routinely made me a separate meal at dinner when I refused whatever she was making (which was frequently). When I had my own kids, I decided that I wasn’t going to make separate meals at dinnertime, because I worried it would perpetuate the same kind of finicky eating that marked so many years of my life. Make one meal for everyone at the table. 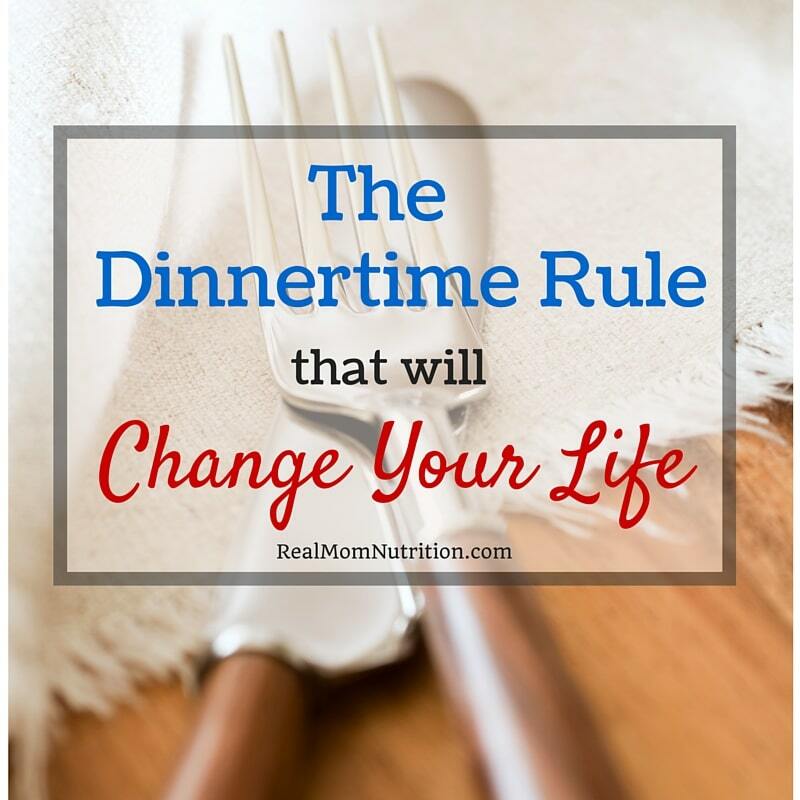 The benefits of this dinnertime rule are huge. 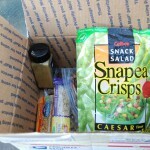 It means you aren’t scrambling to prepare multiple meals like a short-order cook. If your kids aren’t guaranteed a special PB&J (or, ahem, bowl of buttered noodles) when they don’t like what’s on the table, they have more motivation to try what everyone else is having. They’re also learning an important lesson: Not every meal is going to be their favorite–and that’s the way life goes. There’s a stir-fry I serve that all of us love except my younger son, Sam. I’ve (privately) come to think of this meal as The Chicken That Makes Sam Cry. The nights I serve this stir-fry, he usually only eats rice and fruit. As he’s complaining, which he always does when I serve The Chicken That Makes Sam Cry, I reassure him that we’ll have one of his favorite meals soon too–and we do. Making one meal for everyone still means you can tailor the dinner to suit preferences. You can serve things separately—like warm tortillas with the fixings in little bowls, or a pot of brown rice with the veggies and sauce served alongside so they can be mixed (or not). I’ve even ladled out a bowl of plain broth with soup meat on the side. Because it still means that I’ve made just one meal. Caveat #1: You should always be sure there’s something on the table your child likes, even if it’s simply the tortillas and some fruit. Caveat #2: Sometimes, your child will only eat a tortilla and fruit for dinner. That’s okay. There’s one exception to my dinnertime rule: The clean-out-the-fridge dinners we have about once a week or so, when I’m not so much cooking as simply pulling random things out of the fridge to heat up. On those nights, we’re still eating together but each of us may be having something different–and we all get to choose what we want from what’s available. And on those rare nights when I’m cooking for nobody but myself, I still occasionally make myself a bowl of buttered noodles. You know, for old times’ sake. This is a great rule! I always said before I had kids I would never make multiple meals, but now I have a picky eater and I sometimes find myself making him something else after dinner because he didn’t eat anything. Thanks for the reminder and tips! Thanks Brittany. It is definitely an easy trap to fall into, especially when our instinct as parents is to feed our kids! 🙂 But ultimately, breaking the habit will make life easier for everyone! I absolutely agree with this mealtime rule and we follow it at our house with our 5 kids. I also agree with your 2 caveats. We add a 3rd, though, that has made a huge difference in slowly buy surely getting our kids to try (& ultimately like) new foods. We call it a “No thank you bite.” The children are not required to eat a full serving of everything that is served, but they do need to at least try everything. If it is a food that they don’t think they will like – even a food that they’ve tried before & “know” they don’t like – they can say, “I’ll just have a No thank you bite,” and then (respectfully & without dramatic gags or grimaces) they try the questionable food. It’s surprising how often they realize that they actually do like the food, even foods that they previously didn’t like. But if they still don’t like it, they don’t have to eat any more if it for that meal. The best part of the “No thank you bite” is the good manners it instills when they are eating at someone else’s home. They have learned to politely eat a small amount of pretty much anything that is served to them, and also how to politely decline foods that they don’t care for without being rude or dramatic about it. Thanks Brooke. I agree with your point–though we don’t require a no-thank-you bite, I definitely see the value in it. And like you said, it’s so important to equip kids with the skills and manners required for eating in other places and with other people. Thanks so much for your comment! This is the rule in our house and what I tell all my friends w kids. No short order cooking! Most of the time the response I get is “but the kids will be hungry. I can’t send them to bed without dinner!” Which is why your caveats are exactly correct and what I say in response! I do agree, but to me the tricky part is that my son will in fact go to bed hungry and as a consequence, he’ll wake up at 5 or 6 a.m. looking for breakfast. Still working on what to do about that one. . . Put his dinner plate in the fridge for him. He can eat cold leftover dinner for breakfast if he is hungry enough. My kids eat what’s served. We rotate meals so each child enjoys a favorite meal in turn. We don’t do snacks around here so one less excuse for “not being hungry” at dinner time. If we don’t train our kids to straighten up at the table and take nourishment we will have another generation of picky foodie brats running the asylum. P.S. part of the problem probably is the family not stirring itself in the morning until after 6am. My kids are up at 5:30 with hot breakfast waiting for them. No thrashing around at the last moment to be late to school or to work. That’s another lazy habit our generation thinks is normal. My parents were farmers and their day began at “half-past three” in the morning every morning. They both lived into their 90s. Laziness, drama and waste (food or time) held no interest for them. My sisters and I turned out OK.
Oh my! It sure sounds like you could have used an extra hour or two of sleep in the morning. I sure hope you’re having a better day today. 2) They have to make it. 3) They have to clean it up. Totally agree! What freedom I found when I stopped being a short-order cook. Not to mention the loathing of having to prepare individual meals for everyone at dinner time has disappeared as well 🙂 Great post – thanks for sharing! You’re welcome Becky–you’re so right about the freedom. I love this idea and always said I would do the same. However, I’m now facing the reality of a toddler who won’t try new things and meal time has become my nemesis. It’s a constant fight. He even refuses food I know he does like half the time. What age should we expect this behavior to change? It’s so frustrating! The good news is that garden-variety picky eating like this does tend to wane around age 5-6, so it doesn’t last forever! One of the things I like about dinner time is the family time. When my select eater tries new foods which he’ll most of the time not like, he asks if he can leave the table. So, family time lasted less then five minutes. When he is given his own food we get him at the table much longer. I do tell him he has to stay sometimes but, when you are not eating, thinking how dumb this is he does not contribute to the fun the rest of us are having. 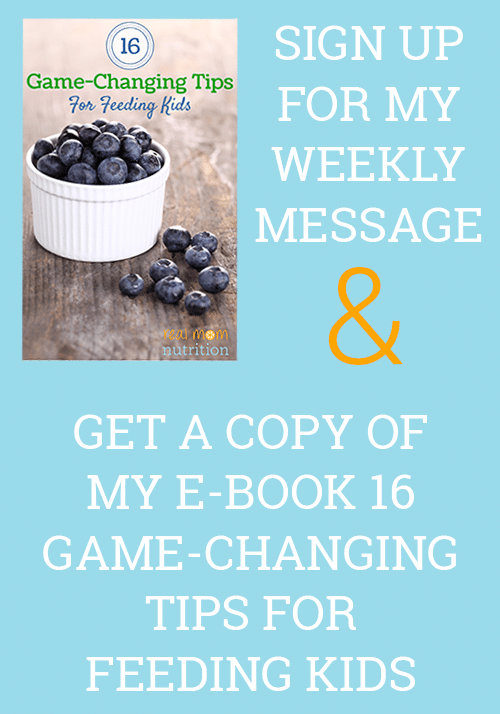 Jeanne–you are so right that all eaters should feel accepted and welcomed at the table. I would encourage you to have both foods on the table that he enjoys and foods that everyone enjoys, so there are choices for all–vs. making him a separate meal (if that’s what you’re doing). My kids aren’t required to take bites of foods they don’t want, but they know the’ll always find foods on the table they like, even if they’re simply eating a plain tortilla from the enchiladas for instance and some fruit on the side. Is there a certain age you started this with your kids? My oldest is almost 4 and extremely picky. I often serve him his own meal and get him to try bites of our food, but he is extremely reluctant. We also have a 7 month old baby who is just starting real food so I am definitively beginning to feel like a short-order cook! Jen–I think it’s important to do from the get-go. So when your baby starts eating table food, have her at the table with you, giving her small bites of the foods you are eating. 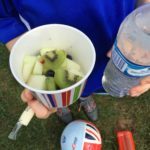 If your son shows a lot of reluctance to new foods, seems scared/worried by new foods, etc., I would encourage you to read this post about extreme picky eating: https://www.realmomnutrition.com/2015/07/07/5-common-problems-at-the-root-of-extreme-picky-eating/ The book it’s excerpted from is a wonderful resource as well if this sounds like your son. I do try to stick to this rule too and think it is important. By the time I get home from work it is an accomplishment to get one meal put togehter that I can’t imagine making multiple things. Great post! I have a very picky 3 yr old and now trying to stick to this rule. I’ve also heard about the benefits of serving meals family style. Just curious, when you serve dinner, do you let the younger kids (especially the picky ones) serve themselves or do you serve the complete meal on their plate for them (then let them choose what to eat from there)? I imagine they will feel more control (thus less resistance) serving themselves however, its so hard to get my daughter to have the desire serve herself those foods. Because of that, sometimes I pre serve it for her, hoping maybe she will try it without any other pressure, but it usually ends up getting picked off the plate with an “I don’t like it”. I guess I just wonder if that is creating pressure for her and I should just back off and let her ask or serve herself? Thanks! Hi Karli–A lot of people swear by family style for the reasons you say, it gives the kids more control over what they choose and kids can select the portion they want (instead of grown-ups deciding what their portion should be). That said, my younger son usually wants me to plate the food for him. I think if your daughter wants you to plate her food and she’s okay with you putting things on and then picking off what she doesn’t like, that’s perfectly okay. I’ve also heard the idea of giving kids a “tasting plate” that’s separate from their regular plate for the foods they’re unsure about. Either way, sounds like you’re giving your kids choice at the table, which is great. 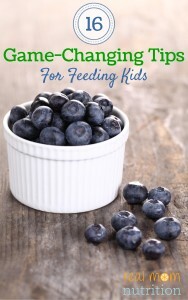 Thank you for your great posts on raising more adventurous eaters. One of my struggles is getting my 2 & 4 year old to be patient enough for me to cook after we dash home at 6pm. More often than not, the kids will come home and raid the pantry and fridge for snacks. I try and keep snacks out of their reach but often find my 4 year old grabbing what ever fruit or bread we forgot & left on the counter. With these pre-dinner snacks their willingness to try new things is very limited. Any tips on avoiding the “snack sneaking” – aside from putting a lock on the pantry LOL – that you can suggest would be helpful. Hi Julia–This is a really common problem that kids are hungry before the designated dinner time. I often recommend families move dinner earlier (like even 4pm). But sounds like you don’t get home until about 6pm, so what how about having something ready to go them–maybe last night’s leftovers on a plate you can reheat (then you can cook and enjoy that evening’s dinner either either by yourself or they can join you and nibble if they’re still hungry). Or a platter of veggies and dip may help tide them over. 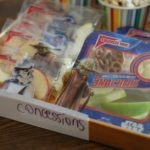 Your kids are still very young so this isn’t a permanent situation–now that my kids are 8 and 12 I’m happily surprised that they can wait until 6:30 or even 7 for dinner without snacking and be hungry and receptive for the meal. I’m hoping for some advise. Our 3 year old, only child, is extremely picky. He eats yogurt, fruit, and crackers. That’s about it, and while that’s healthy, we would like to get him into more food. Also, we were advised by his allergist for him to start eating cakes, cupcakes, (baked egg goods) to help with his egg allergy. Lately, I’ve been putting one new item on his plate at dinner, he spots it immediately, and ask for it to be removed. Any tips?